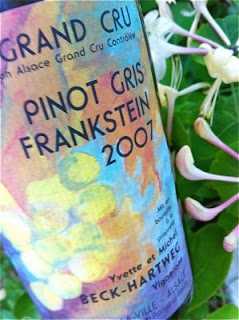 Grand Cru Frankstein is of eight Grands Crus which lie on granite, the rock that the Vosges mountain range is made up of. Granite is hard and resistant to weathering, typically with thin, sandy soils that provide fast heating during the day, rapid cooling at night and that are well drained. Here, a skilled grower can choose to either create voluptuous, easy-going wines with character of fruit salad, or firm and crystalline wines in a more restrained style, without hints of botrytis. Florian Beck-Hartweg has, with great skill and dedication, chosen the latter course.